I absolutely love seeing pictures of my own daughter and family! Who doesn't? Now there's a company, called Little Blue Sister Gifts, that makes it possible to display your favorite photos in a variety of wonderful ways. They make a host of personalized products, such as tote bags, mouse pads, aprons and the like which all feature your choice of photos. 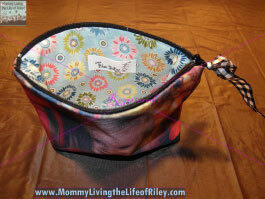 Recently, I had the opportunity to review their signature cosmetic bag, "The Emmie". Keep reading to learn more about it! 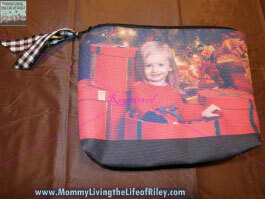 I reviewed the "The Emmie" Cosmetic Bag from Little Blue Sister Gifts, which retails for $29.99. 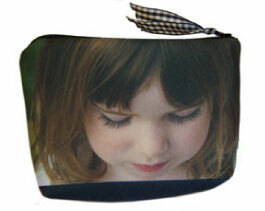 "The Emmie" is a zippered cosmetic bag measuring 8"W x 5"H. It is designed to feature either one or two of your favorite landscape-style photos, and even includes a cute patterned fabric for the lining. This bag can easily slip inside your purse or tote bag and can carry plenty of goodies, besides just cosmetics. Currently, I use "The Emmie" to carry my grocery and store coupons and gift cards. 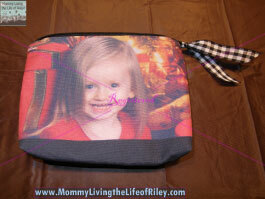 Customizing this cosmetic bag from Little Blue Sister Gifts couldn't have been easier! I simply chose two of my favorite pictures of Riley and emailed them directly to the company. Little Blue Sister Gifts immediately began customizing "The Emmie" with these pictures and my new bag was sent to me very quickly. Disclosure: I received "The Emmie" Cosmetic Bag from Little Blue Sister Gifts in order to facilitate my review. No other compensation was received. This product review is based on my own personal experiences with this item and is completely honest and objective.